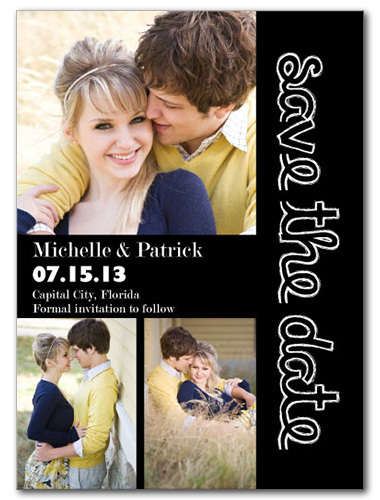 Tell your very own love story in full color illumination, with our Simply Collage save the date cards. A deep black backdrop provides a stunning contrast for white lettering, displayed in your choice of wedding font. All of this is accented by three of your favorite photos. Whether you're telling the tale of Prince Charming and his bride-to-be, or you have more of an action or comedy to tell, this card allows you to do it with style. Simply Collage For the best experience, we recommend personalizing your stationery on a desktop computer.